4pp., 12mo. Bifolium. Aged and worn, and with closed tears up gutter and one fold. Addressed to 'My dearest Miss OMeara'. With reference to her first published work, 'St. Etienne, a Romance of the First Revolution' (T. C. Newby, London, 1845), she begins by thanking her 'for the Review which the Doctor sent me, as he promised'. She mentions other reviews, stating that one 'did not review the Book it praised the writer – the only thing stated of the Book is however very good, for it is htat the Characters are so very well done that they resemble Miss Austen'. [ 95 Bedford Court Mansions, London. ] 1920 and 1921. The author is not named, but this item is from the papers of Sir John Pollock, and is in his autograph. Sir (Frederick) John Pollock (1872-1963), 4th Baronet of Hatton (Eton; Trinity College, Cambridge; Harvard Law School) is a strangely-neglected figure. His brief obituary in The Times (23 July 1963) is headed 'Playwright and Author', but the best account of his career is the one he himself contributed to Who's Who. Pollock took great interest in Russian affairs, his numerous works including 'War and Revolution in Russia' in 1918, and 'The Bolshevik Adventure' the following year. [ Royal Accounts ]Two MS. account books, both in German, of the income and expenditure in Hanover of Princess Adelaide ('Königin Adelheid von Großbritannien'), widow of the English King William IV. With reference by her housekeeper inserted. [ Princess Adélaïde of Orléans. ] Her seal in black wax, on part of envelope addressed in her autograph to Leopold II, King of Belgium. [ Elizabeth Wright Macauley, poet, actress and Owenite preacher. ] Corrected draft of Autograph Letter Signed ('Eliz Wright Macauley'), 'To the King' (i.e. King William IV), in favour of the royal imposter 'Princess Olive of Cumberland'. 52 Clarendon Square, St Pancras [ London ]. 23 September 1833. 10pp., 4to. In fair condition, on aged and worn paper. An accompanying entry from a French manuscripts catalogue states that the letter was sent to the magazine 'The Age', but not printed. 2nd Signal Training Centre, Prestatyn, North Wales. Between 1939 and 1942. The material is laid down and loosely inserted on 39pp. 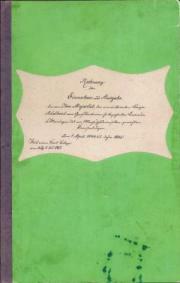 of a folio album with paper covers (the ATS badge drawn on the front). The album itself is aged and worn, but the material inside is in good condition, with light aging.Biographical information on Wynne-Edwards is given in a loosely-inserted copy of an autograph letter to 'Mrs. Place not stated. 3 February 1824. On a piece of 12 x 19cm paper. Discoloured and chipped, and laid down on an 8vo leaf removed from an album, with cut-out printed family crest letterheads in various colours on reverse. At head of page, in another contemporary hand: 'H. R. H. Princess Sophie's handwriting'. The letter is written in a difficult hand, and begins: 'The Princess Sophie returns Mr Clarke the enclosed Letter, & she also sends the sum of £1 .. 8 .. 9 for the 4 yds & 1/2 of <?> <?> he was so obliging as to purchase for her.' 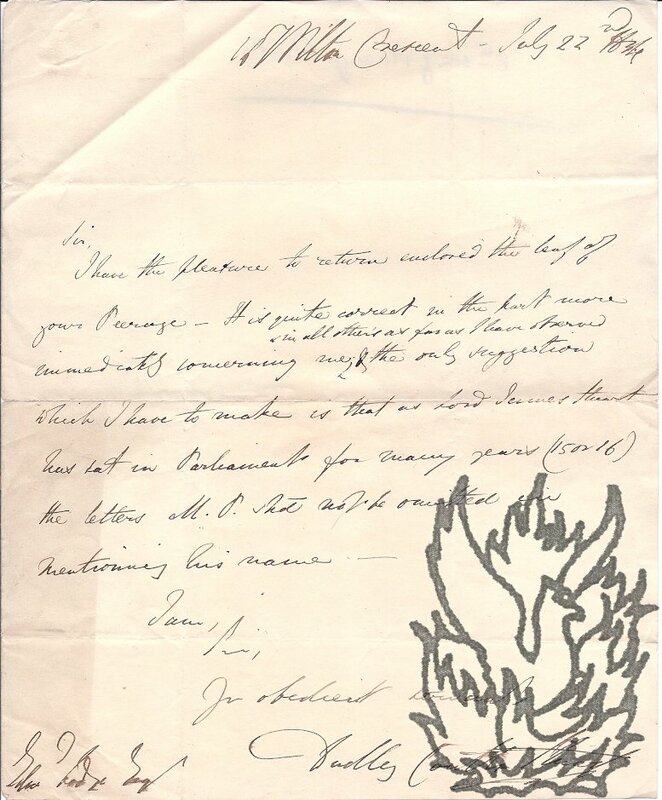 The letter continues with a request, ending '[...] this is much the fashion'. [Princess Marie Louise of Schleswig-Holstein, granddaughter of Queen Victoria.] Autograph signature. On letterhead of the Ambassadors' Court, St. James's Palace, S.W. No date. 1p., 12mo. In fair condition, on lightly aged and worn paper. Folded twice, with vertical closed tear along crease at head, unobtrusively repaired on reverse with archival tape. Clearly in response to a request for an autograph. Reads, in a bold hand, 'From | Princess Marie | Louise'. [Printed item.] An Address to Her Royal Highness the Princess Charlotte, on Her Marriage; shewing the Cause of the Distress of the Country, and pointing out a safe and effectual Remedy. pp., 8vo, paginated 487-530. Rebound in modern red cloth binding, with red leather label on cover, with title 'ADDRESS TO HRH PRINCESS CHARLOTTE' in gilt. In fair condition, lightly aged and worn. [Shelagh Maitland, artist's model.] Autograph Letter Signed, offering her services to the Duchess of Kent, stating she has worked for Lord Plunkett, Cathleen Mann, Simon Elwes, Sir John Lavery, T. C. Dugdale, David Jagger. 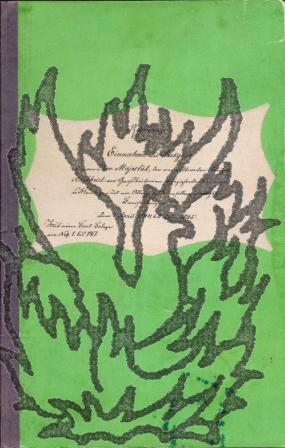 With risqué autograph poem. 40 Queensborough Terrace, W8 [London]. 19 July 1938. Both items are in an envelope addressed to the Duchess at 3 Belgrave Square. The envelope and its contents are on aged and creased paper. LETTER: 2pp., 12mo. Bifolium. Knowing that the Duchess is 'a well-known artist', she is offering her 'services as a model'. 'I was permanent model to the late Lord Plunket [sic] and have been painted by Cathleen Mann, Simon Elwes, Sir John Lavery, T. C. Dugdale, David Jagger and several other well-known painters.' She describes her appearance and asks to be granted an interview. POEM: 2pp., 12mo. In pencil. Unsigned, but clearly by Maitland. Two Autograph drafts of a long poem by Arthur Benoni Evans (later Professor of Classics and History at Sandhurst), titled 'Lines [Verses] on the Death of the Princess Charlotte'. Both with corrections and emendations, and one signed 'A. B. Evans'. Neither with date and place [one draft on paper watermarked 1816, and the other on paper watermarked 1818]. Princess Charlotte of Wales, the only child of the Prince Regent, died in 1817 at the age of 21. Many poems of mourning were published, but whether Evans's was among them is uncertain. Both drafts are in good condition, on aged paper; the first with short closed tears to the spine. DRAFT ONE (the earlier? ): Title: 'Verse on the Death of the Princess Charlotte', altered from 'Threnodia Augustalis, Odes on the Death of the Princess Charlotte'. 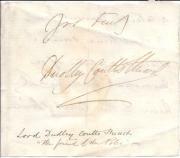 Autograph Signature ('Dudley Coutts Stuart') of Lord Dudley Coutts Stuart, husband of Princess Christine Bonaparte, and 'the friend of the Poles', on part of a letter. Square of paper, neatly torn from letter. Lightly-aged and creased. 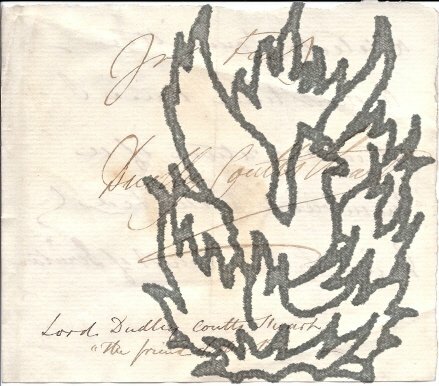 On one side firm signature ('Yrs truly | Dudley Coutts Stuart'), with docketting at foot ('Lord Dudley Coutts Stuart | "The friend of the Poles" -'). On reverse: '<...> a select Committee - A short time I obtained a return of a memorial presented him to the Court of Directors'. 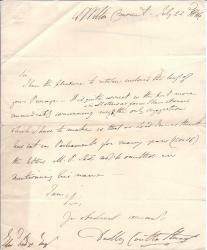 Two Autograph Letters Signed ('Charles Gibson' and 'Charles E. Gibson') by Gibson, as Lieutenant and Adjutant of the 49th, written to his 'Aunt Kate' from Sebastopol during the Crimean War, including a description of horse races during the armistice. Letter One: 12mo, 4 pp. Bifolium. 75 lines of text. Clear and complete. Good, on lightly-aged paper. Expresses regret at 'Morten Edens melancholy death, so young & so clever as he was'. 'There is great talk of Peace. We hardly know if to believe it - few will be sorry should the news prove to be true, as I think most of us have had enough fighting. Apparently refers to his sweetheart under a cypher. She has not written to him, but 'London gaieties have little time for correspondence'. 'The weather here is something awful - cold & wet, fogs & sleet.